Published: April 26, 2012 at 11:01 p.m.
NEW YORK -- You never know who you might see at the NFL draft, but one celebrity in attendance Thursday night at Radio City Music Hall still took us by surprise. 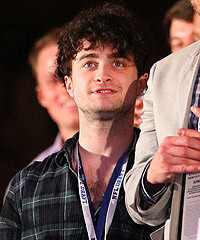 Harry Potter, aka Daniel Radcliffe, was in the house. Our in-house spies told us Radcliffe is an avid NFL fan who has become borderline obsessed with the game. While he's still learning the game, Radcliffe is a big New York Giants fan who always has wanted to come to the draft. This probably won't come as a surprise, but Harry Potter is a big-time fantasy (football) guy. This is the part of the post where I'm supposed to drop some serious Hermione references, but I'm the last man on Earth who has yet to see a Harry Potter movie or read one of the books. I always respect a celebrity more when they legitimately know sports and show real fandom. Showing up to watch NFL Commissioner Roger Goodell read names off a card qualifies.